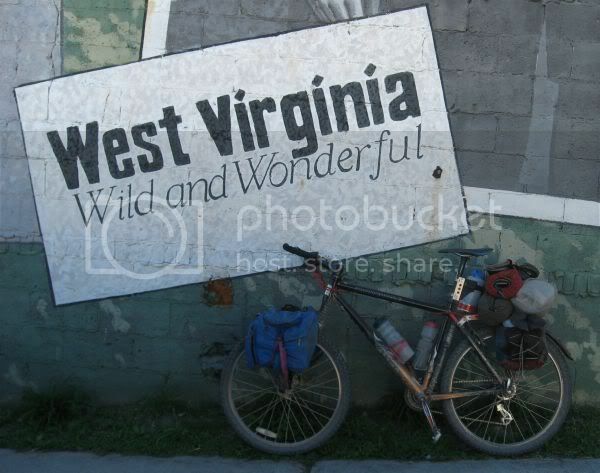 This trip was a 4 day loop ride began and terminated in Marlinton, WV ridden 9/6/2010 to 9/9/2010. 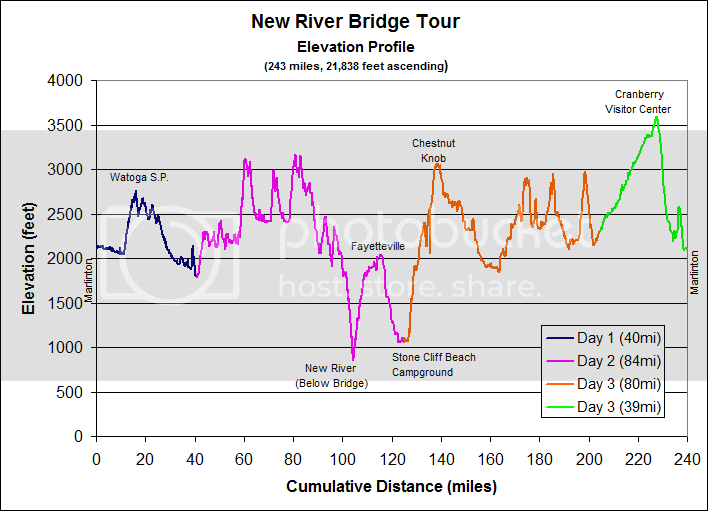 The route cuts through parts of the southern Monogahela National Forest (MNF), and then across a large swath of rural WV to New River National River [National Park]. From the river, the route continued back to the MNF and into the Cranberry Backcountry area and finally returned to Marlinton. The execution of this ride ended up being predominately paved and dirt roads. Single track had been incorporated in the planning stage, but for one reason or another, the single tracked was skipped during the ride. The climbing elevation per day doesn’t seem that bad, but I will readily admit that the sum total wiped me out. From Marlington, the route heads south on the Greenbrier Rail Trail. The Greenbrier Rail Trail is a crown jewel of WV rail trails. 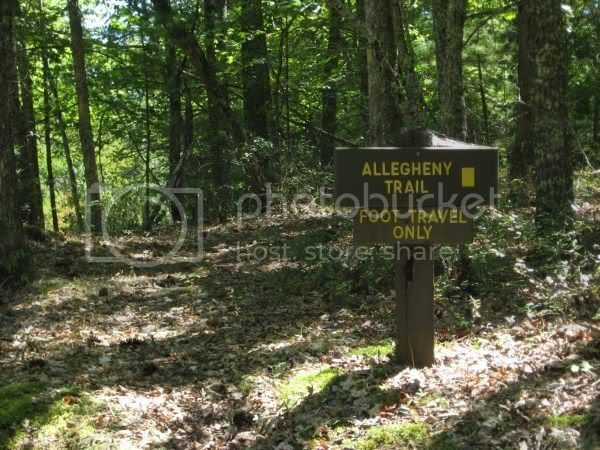 Beautiful scenery, excellent trail maintenance, camp spots with water and outhouses are all part of the well executed trail. I’ve ridden it before, so one this trip it was just used a conduit to other places as well as providing a convenient trailhead to leave the car. No biggie. Take the road. The upcoming county roads will make up for the loss of a little single track. 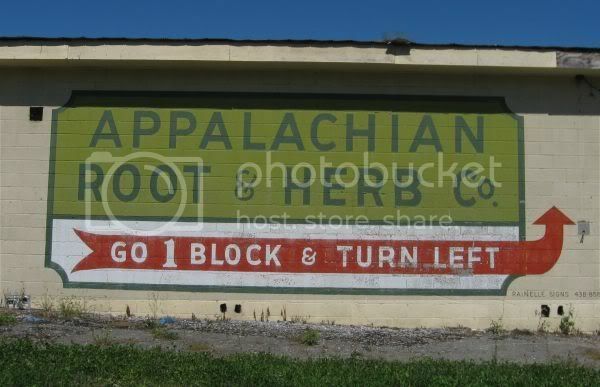 I’ve found that ‘county roads’ in WV are complete wildcard. At times, they are your typical, two lane, secondary, maintained paved road. Or they are something else. Single lane paved, rough gravel, smooth gravel, dirt, rough dirt down to 4wd high ground clearance required. This Yankee hasn’t figured out how you can know what to expect in advance… the only thing that seems standard is that single numbered roads (like “CR 32”) are generally higher quality than dashed numbered roads (like “CR 32-16”). After a good bit of county road, I ended up at Blue bend on Anthony Creek. I had every intention of backtracking a bit to pick up the second section of single track (South Boundary Trail), but decided a lingering swim and relaxing at the swimming hole was more appealing. The single track can be ridden on a trip latter this fall… swimming might not be as appealing once the temps start to drop. After swimming, I cruised to a camp spot farther downstream at the confluence of Anthony Creek and the Greenbrier River. Day 2 started with brilliant, late summer sunshine. After crossing a few mountains, I arrived in Rainelle, WV. From Rainelle, it was west bound on US60 to get to the New River Bridge. The bridge was the main reason to ride this loop. The span is over 800 feet above the river–high enough for BASE jumping and is the focus of the annual Bridge Day Celebration. I’d driven over the bridge in the past, but checking out the bridge up close and in-person from the bottom made the bridge seem much more impressive. After checking out the bridge, supplies were picked up in Fayetteville and then a short ride to Minden-Thurmond Rail Trail. 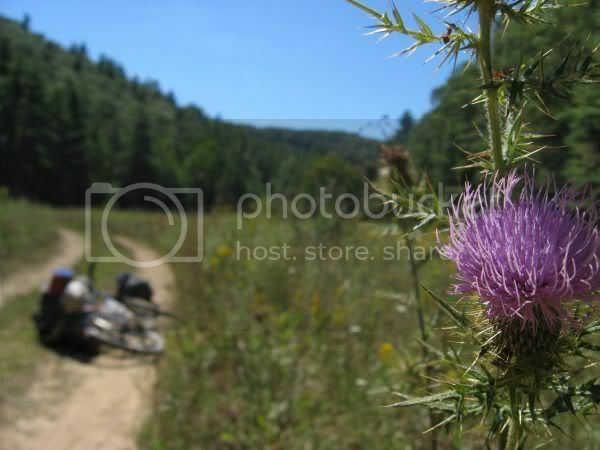 This is pretty cool rail trail; it clings to the mountain side and has a relatively steep grade for a rail trail. Night 2 was spent at the campsites at Stone Cliff Beach. 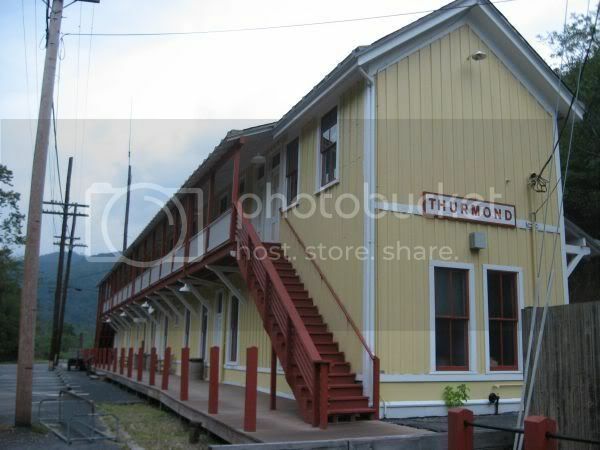 Wed AM started with crossing the bridge at Thurmond to the train station (below) and the long grind on dirt roads towards Babcock State Park. So here I am on an old strip mine haul road, numbered as a county road. This was not my expectation. The Delorme Atlas had a fish icon along the neighboring stream. I figured that this would be nice road tucked into hemlocks along a trout stream… the reality was a dusty haul road running along an acid mine impacted stream. You never can tell. By the evening of Day 3, I had made a decision to forgo 10 miles of single track through the Cranberry Backcountry and take the easy route on Forest Roads around the Backcountry area. I settled on a campsite along the river. The objective for day 4 was just to get back the starting point in a leisurely manner. 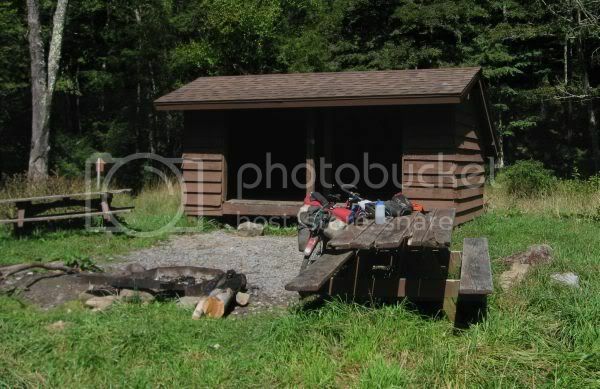 The Cranberry Backcountry has numerous shelters along a 16 mile stretch of gated forest road. It looks like the shelters are popular with equestrians. 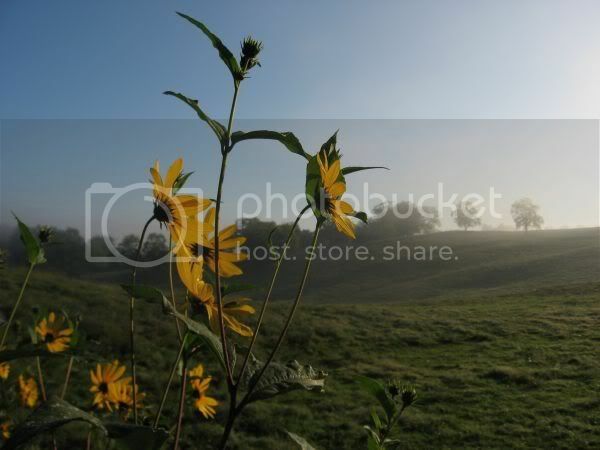 There is a Nature Center near the Cranberry Glades. Stopped in there and checked out the displays, and then road the final 20 miles back to Marlinton, arriving about 4:00PM. Most trips spur ideas for more places to ride and explore. This trip was no exception. A return trip needs to be planned to the single track that was detoured around, as well as explore more of the potential of the southern MNF. 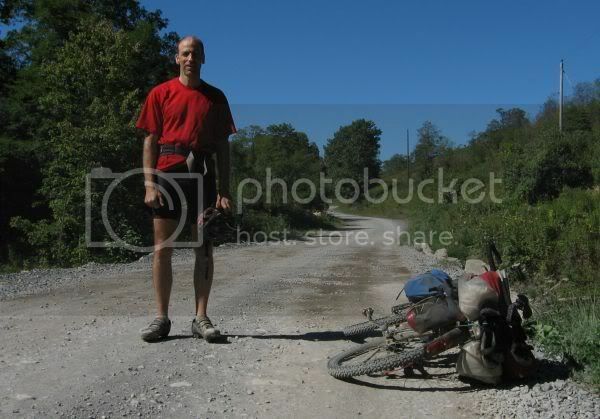 On the trip with the route you did, how much of that was actual singletrack? Did it end up being mostly doubletrack and dirt/gravel roads? It was planned and ended up being almost all double track, back roads (dirt/gravel) and paved roads. I had planned in about 15 miles of single track from the start, but due to posted trail restrictions (not known in advance) and latter in the trip when I was pretty tired, the single track was skipped. Large portions of the ride where accross private land where single track opportunities don’t exist, so public roads are the only alternative. 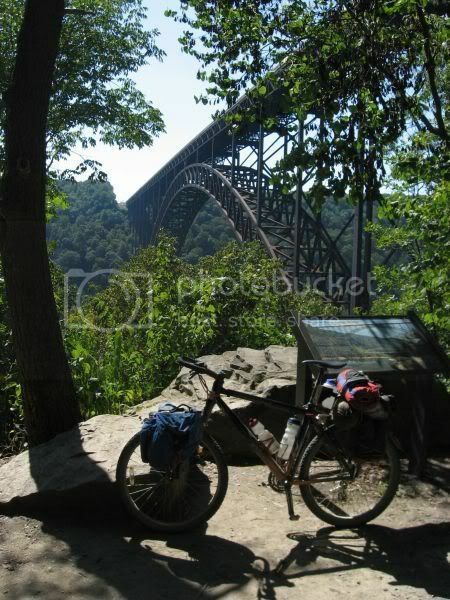 The objective of the trip was to ride to the New River Bridge so lack of single track was not primary concern. 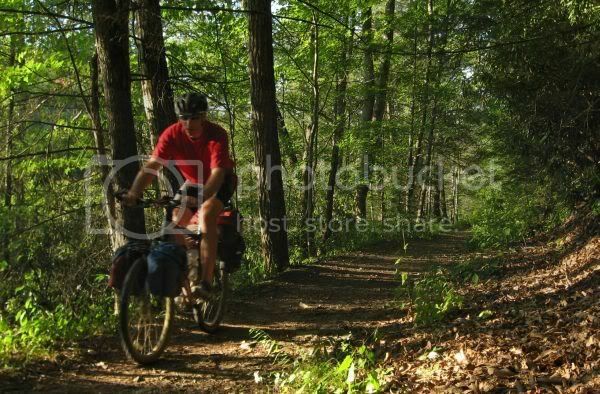 Much more single track intensive routes can be devised if one stays within the boundries of the Monongahela , Jefferson and George Washington National Forests. As always, your shots are great. We stop at the gorge visitor center and go down the steps every time we go to N. C. to see my brother. But that’s like being dropped in by helicopter. We miss everything else. This was a stunning trip you did. Still. . .suspension is for sissies. Thanks for an awesome report! Can you provide an updated link to the route information (not working). I’m looking to duplicate this ride in two weeks. 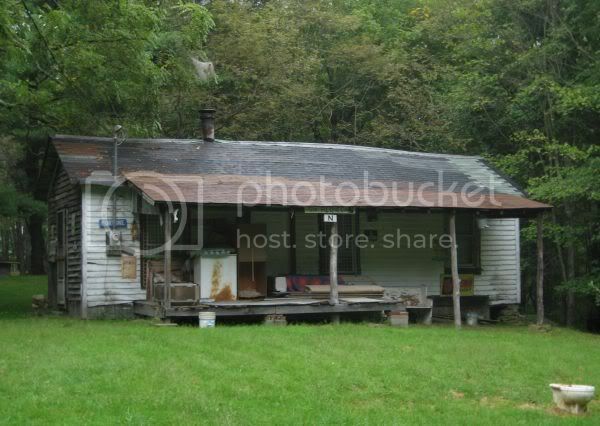 That shack you took a picture of was it on the Mountain (Beurry) behind the train station in Thurmond, WV. My Grandad was born up there and my Great Uncle was the mayor and sheriff at 1 point. 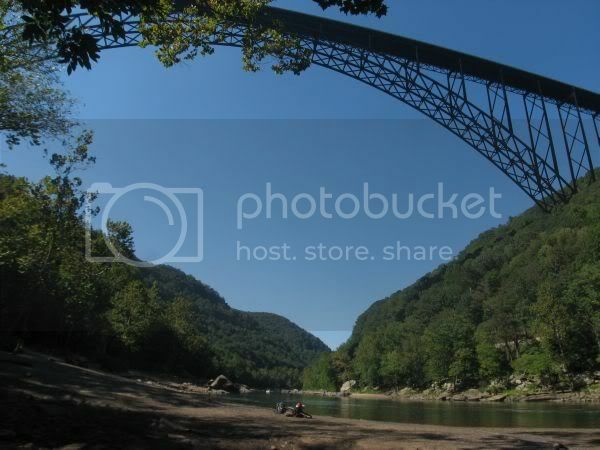 It is the one of the most Beautiful areas I been to in the U.S . Im glad yall came down to visit, as family would say.